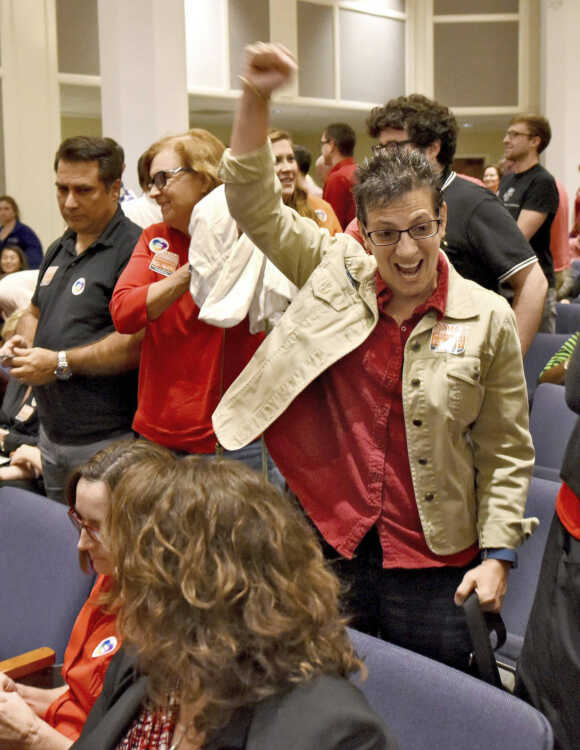 Gloria Perino celebrates after the Jacksonville City Council voted 12-6 to support the Human Rights Ordinance on Feb. 14 in Jacksonville, Florida. De Pere, Wisconsin -- a Green Bay suburb not noted for LGBT activism -- took a big step last week toward joining the movement. After an intense public meeting, its city council gave preliminary approval on a 5-4 vote to a measure that would broaden the local nondiscrimination ordinance to cover transgender people. The measure would prohibit businesses, employers and landlords from discriminating against people because of their gender identify. Alderman Casey Nelson, who introduced the measure, said he wasn't sure whether anti-transgender bias was a problem in De Pere, but he wanted to send a message the city of about 25,000 was welcoming and tolerant. 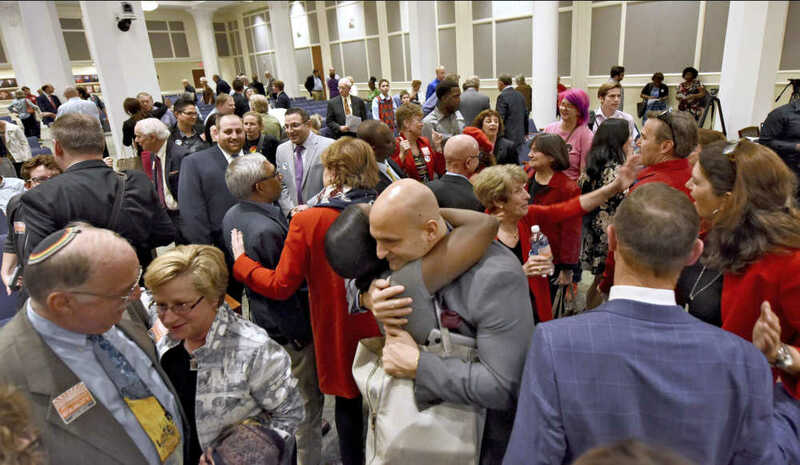 Duval Schools superintendent Nikolai Vitti, center, is hugged after the Jacksonville City Council voted 12-6 to support the Human Rights Ordinance on Feb. 14 in Jacksonville, Florida. At left are Rabbi Rick Shapiro, the interim senior rabbi at Congregation Ahavath Chesed, and Nancy Broner, executive director of OneJax. Advocacy groups say several hundred municipalities across the country have LGBT-inclusive anti-bias measures -- many of them in the 31 states that lack fully inclusive statewide laws. Skeptics say the local laws, in some cases, are mostly symbolic and not zealously enforced. Yet LGBT activists view them as a heartening barometer of nationwide support at a time when President Donald Trump's administration has taken multiple steps that jeopardize LGBT rights -- including weakening protections for transgender students and seeking to ban transgender people from military service. Morgantown, home to West Virginia University, was among the most recent additions to the list of communities taking LGBT-friendly action. Its seven-member city council voted unanimously Oct. 17 to extend nondiscrimination protections to LGBT people. Mayor Bill Kawecki said the action "simply verbalized the kind of community I really hope that we are." Earlier in the year, two big cities in South, GOP-led states -- Jacksonville, Florida, and Birmingham -- adopted similar ordinances. Birmingham became the first Alabama city to take the step; Jacksonville had been one of the most populous U.S. cities that lacked such a law. The congressional impasse leaves it up to individual states to set their own policies, but there has been little action recently. Since 2009, Utah is the only state where lawmakers have voted to join the minority of other states, which extend nondiscrimination protections to LGBT people. And Utah went only part way -- applying the protections to employment and housing but not public accommodations. The GOP-led legislatures in Arkansas and Tennessee have gone a step further -- enacting laws barring municipalities from passing their own LGBT-inclusive ordinances. In Arkansas, the attorney general is asking the state Supreme Court to prevent the city of Fayetteville from enforcing an ordinance of that nature it passed in 2015. Allen Whitt, president of the conservative Family Policy Council of West Virginia, predicted legislators in his state would propose laws next year that would emulate Arkansas and Tennessee and strike down the local LGBT-friendly ordinances. "It's ironic that the party of small government wants to interfere with cities, which want to provide common-sense protections for all their citizens," said Sarah Warbelow, legal director for the Human Rights Campaign, a national LGBT-rights group. When De Pere's health board discussed the ordinance in October, supporters in the audience included Annette and John Grunseth from the neighboring town of Allouez, whose adult daughter is transgender. Wisconsin is one of two states, along with New Hampshire, that extend nondiscrimination protections to gays and lesbians, but not to transgender people. A transgender-inclusive statewide bill is backed by Wisconsin Democrats but has dim prospects because of opposition from majority Republicans.